Faithfully Catholic, we educate children in the Classical tradition. Fulfilling the Catholic Declaration on Christian Education, Gravissimum Educationis: Our graduates will be elevated morally, intellectually, and spiritually by following the example and teaching of Jesus Christ. At Saint Benedict Catholic School, we guide our students toward full communion in the Body of Christ. Faithful to the teaching authority of the Catholic Church, we participate as an extension of the family and provide a welcoming Christ-centered community that nurtures our children in achieving their God-given potential. Through Classical academics and Catholic formation, we help our students approach learning with joy and virtue, integrating faith and reason, and cherishing the pursuit of wisdom and truth. 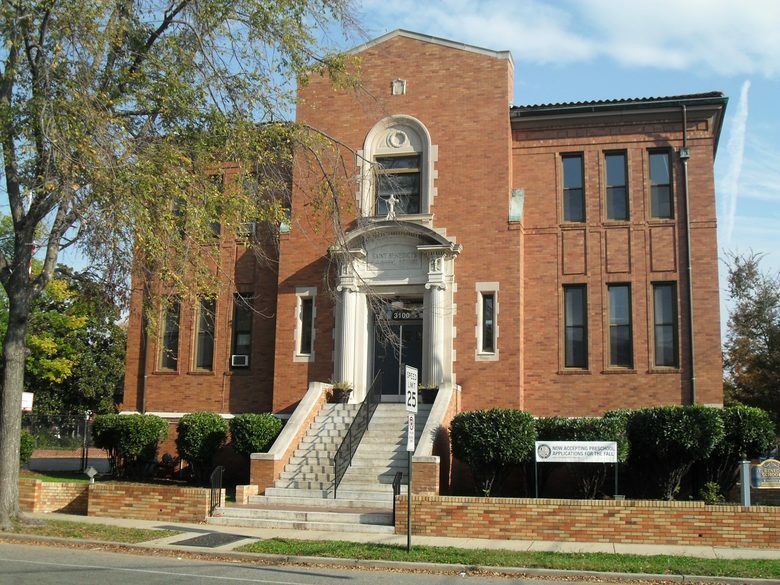 Saint Benedict Catholic School is an outgrowth of the old St. Mary School, which was formerly located in downtown Richmond and was staffed by the Notre Dame Sisters. In 1868, the Benedictine Sisters replaced these sisters. By 1884, there were approximately 217 children in Saint Mary Parochial School. In 1919, on the corner of Grove and Belmont Avenues, Saint Benedict School opened, with classes being held temporarily in the convent. Sister Edward Galloway, O.S.B. was the first principal of the school, which replaced the old Saint Mary School. The convent was moved in 1923 to make room for the proposed school building. Excavation for the new building was begun immediately and was completed in 1924. By the late 1940’s the school was no longer large enough to accommodate the increasing number of students, so an addition was built in 1949. Saint Benedict School is AdvancED accredited and the Diocese of Richmond is AdvancED accredited as a school system.